Back in the late 80's, before the Internet, MP3s & iTunes, there was "The Personics System". It was a legal, authorized way of having a personal, custom mix tape. It was in a way the same as what we had in the Philippines in the early 80's. You go to these "taping/recording/dubbing" places along Raon St. in Quiapo (& other parts of the Metro). 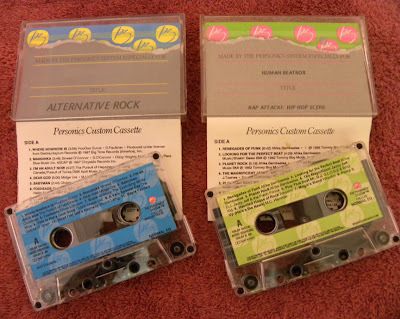 You pick your songs that would fit in a C-60 or C-90 blank cassette tape & pay. They usually record the songs off the vinyl (or sometimes a direct cassette dub). Simple as that. Of course, that was illegal, unregulated & didn't pay royalties. The early form of piracy in the Philippines. Here in the States, they've introduced "The Personics System". There were kiosks placed at major record music stores where you could listen to song samples. There was also the monthly magazine/catalog that listed the songs to choose from. Songs were priced from 50 cents to like $1.50. Once you picked your songs, you take it to the counter where they process your order. I'm not really sure on how it worked but they used a special deck. Nakamichi to be exact, which was hooked up to a computer system, which was probably hooked up to their network (i.e. modem/telephone line or early internet). I would think now that they may have used some sort of digital audio format like WAV; processed & recorded via hi-speed dubbing. They also printed a custom j-card. 8. This Is Not A Love Song - Public Image Ltd. The Personics System used TDK High Bias Tapes, Dolby System Digital Sourcing and Nakamichi High Speed Transport. For more info, just search on google: "personics system"